1. Aniruddha ( अनिरुद्ध ), was the son of Pradyumna and the grandson of Krishna. 2. He is said to have been very much like his grandfather, to the extent that he may be a jana avatar, avatar of Vishnu. The four important Vishnu extensions are Vasudeva, Sankarsana, Pradyumna, and Aniruddha. These four are considered to be vishnu-tattva or Vishnu's plenary expansions. 3. He is also called Jhashanka and Ushapati. 4. He had a son named Vajra, who later became the King of Indraprastha. 5. Anirudha learned archery from Arjuna. 1. Pradyumna (प्रद्युम्‍न) was the son of Krishna and Rukmini, and father of Aniruddha. 3. In the Treta Yug when Lord Shiva was in meditation at that time Kamdev became barrier for Shiva. Angrily Shiva burns Kamdev. Kamdev’s wife named Rati was very sad, and Shiva blessed her by promising her that in next birth he will be part of Krishna. And you will be marrying him. 4. Pradyumna (Kamdev incarnation) married to Rukmavati (Rati incarnation), and gave birth to Aniruddha. 1. A princess named Usha, daughter of Bana, fell in love with Aniruddha and her love brought him to her apartments in her father's city of Sonitpura in Assam. 2. Bana sent guards to seize him, but the valiant youth, taking an iron club, slew his assailants. 3. Bana then brought his military powers to bear and secured him. 4. On discovering that Aniruddha had been carried away, Krishna, Balarama, and Pradyumna went to rescue him. 5. Bansura was a great devotee of the god Shiva and had 1000 arms, as a result of which no one had ever been willing to fight him. 6. Blinded by his pride, he asked Shiva to give him a chance to fight with someone as strong as himself. Shiva therefore cursed him to defeat in war by Krishna , an Avatar of Vishnu. 1. Only after some months Krishna came to know where his grandson was and launched an attack on Banasura with a big army. Thus a great battle was fought. 2. When the army laid siege to his city, Banasura staged a fierce counter-attack. 3. 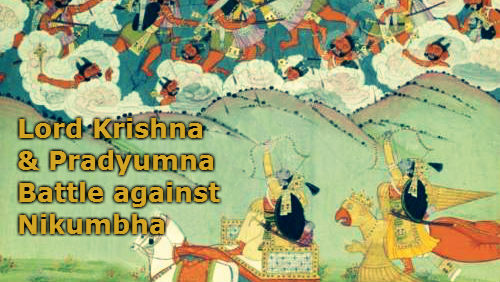 At this point, Lord Shiva joined the battle against Krishna because he had promised protection to Banasura. 4. The fight was intense in all directions, and Siva caused a mighty fever with three heads and three legs. But Krishna generated a counter-fever. 5. Ultimately Krishna’s forces were close to victory and Krishna himself was vigorously cutting off the myriad arms of Banasura. Siva again intervened because of his promise to Banasura. 6. Krishna, however, assured Siva that he had no intention of killing Banasura, but would leave him with only four arms so that his power would be limited. 7. However, in honour of the demon’s boon from Siva, Krishna promised that Banasura would have nothing to fear from anybody in the future. 8. Bana was defeated, but his life was spared at the intercession of Shiva. 9. Gratefully, Banasura prostrated before Krishna and then had Aniruddha and his bride, Usha, brought to Krishna in a regal chariot. 10. All then returned to Dvarka, where Krishna’s victory in the combat with Siva was celebrated with festivity.